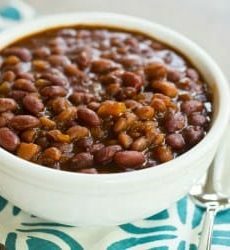 Fabulous baked beans made in the Crock-Pot! In a 4 to 6-quart slow cooker, stir together all of the ingredients. Cook on low for 12 hours. Remove the lid and continue to cook for an additional 4 hours, or until the consistency reaches the thickness you desire. Leftovers can be stored in the refrigerator in an airtight container for up to 4 days.